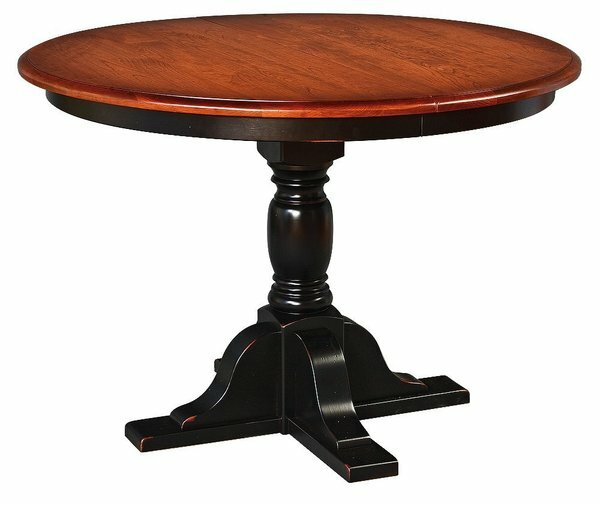 Single pedestal perfection comes to kitchen or dining room in the form of an Amish Single Pedestal Inn Keepers Table. The handcrafting is evident for this round table that's supported by a detailed column and sturdy wooden base. The Inn Keepers Table is part of the Lancaster Collection that has been making fine furniture since 1974. Choose from oak, cherry or brown maple wood for this dining table. We can already see the smiling faces gathered at the Inn Keepers Table. Custom options let you bring home the version that will serve your family best. The table top is a rich 1" thick as our Amish woodworkers feel nothing less will do! Six sizes to choose from to best fit your space. For the 42" and 48" sizes you can add up to two table extensions. They do not self store in the table. This table has gear slides that make it easy to add extensions for special holidays or parties. You can choose the table edge style you like best along with the wood, finish and protective varnish. The Amish North Glenn Single Pedestal Dining Table makes a lovely choice for a country style kitchen. Please email or call us with any questions about customizing your table. Our Furniture Specialists are here to help.Thank you for shopping with DutchCrafters.